Jessica really loves to tell this story, while we were dating I slowly brought her into my crazy head of ideas. Thankfully, she was a woman who not only cared about movement, but loved a good challenge. She will tell you one day while we were filming at a park in 2008, I told her, “hey, try this….” That “this” would the Ultimate Sandbag Training exercise that would open up so many opportunities. I had no idea that a singular exercise could be so powerful, but as I would see soon after, this Ultimate Sandbag Training would be truly a game changer. Why would I say lunging is even more important than the lifts everyone loves to show on social media? Lunging gives us some of these great advantages which is why it is a big point of emphasis in our DVRT Ultimate Sandbag Training system. -We have directional movement which means we have to learn to move, be strong, and reactive more than up and down, but how we move in life/sport. -There is a fine balance of stability, mobility, strength, and power in order to execute a lunge. -Lunges automatically have multi-planar stresses as we have to move through one plane of motion, we must resist other planes. -Increasing intensity of lunging can be as simple as changing the direction of our movement. We quickly see why lunging is both paramount in human movement and DVRT Ultimate Sandbag Training. The MAX lunge was so intriguing to people because they hadn’t seen anything like it. The cool factor definitely played a role in its initial excitement, but what was more important was the thought process behind the drill. Our DVRT Ultimate Sandbag Training system discusses a lot about the chains of the body. That is because creating connection is what functional training is ALL about. As spine expert, Dr. Stuart McGill puts it, creating “linkage” is what makes functional training create such great levels of strength and resiliency. Sadly, most people don’t know their bodies well enough to know what we are trying to connect. As you see in the diagram above, there are several chains of the body that are always active and always working together to help us make complex motion seem seamless. The goal of the MAX lunge and why it is so important in achieving so many fitness goals is that done correctly, it elevates our ability to connect to all these chains! When people ask about DVRT Ultimate Sandbag Training being good for strength, not just conditioning, I challenge them to re-think what they think of strength! The Best Exercise Out There! You might think that was me pumping up my own exercise, but that sentence was uttered by renowned strength coach, Robert Dos Remedios, several years ago. Coach Dos saw the great value of the MAX lunge in teaching his athletes how to decelerate and save their knees and low backs. As Coach Dos points out, most injuries occur to our inability to resist movement, not produce it! While most focus on the powerful movement of the MAX Lunge a big concept we discuss in DVRT Ultimate Sandbag Training is being able to decelerate. Most are so quick to want to swing the Ultimate Sandbag to great heights, they miss the quality of their ability to decelerate properly. In other words, we miss a wonderful opportunity to build incredible success. I’ve heard the above sentiment more than a few times from fitness professionals. They like the idea of our DVRT Ultimate Sandbag Training exercises like the MAX lunge but don’t feel like they can get clients there. They miss the true beauty of our system which is having progressions! You should NOT start with the MAX lunge day one. Learning how to take advantage of all the qualities that the MAX lunge has to offer requires time and building success in the foundational movements. DVRT Master, Cory Cripe and Paige Fleischmann, show great examples of how we build from the foundation with our Up Downs. Most people miss the subtleties of Up Downs. We are teaching how to decelerate, then how to create stability (the leg that remains down), while the other side works on mobility while the trunk is creating stability. 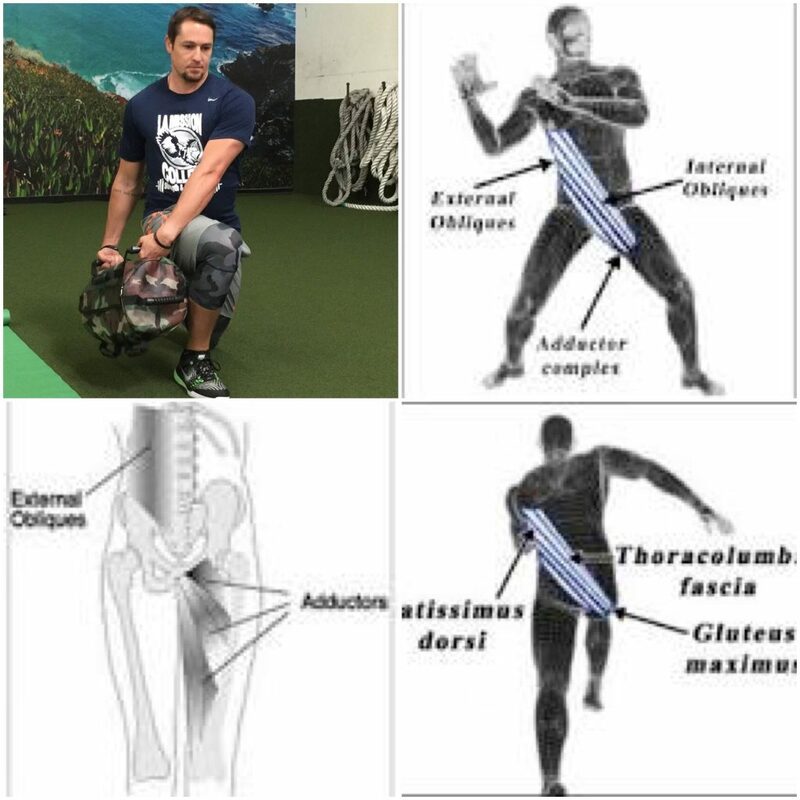 During all this work we take away elastic energy and have to create tons of strength, especially in the hamstrings and glutes to get to the top. We progress by changing to the front load position and adding the small amount of thoracic rotation to build that need to move through all 3 planes of motion. As DVRT Master, Greg Perlaki shows, it isn’t a weird torso turn at the bottom. What we are doing is taking advantage that our body is like an elastic band and by moving down and rotating slightly at the same time we are preloading our body to take advantage of the spring that comes from loading these kinetic chains of the body. As we move to the MAX lunge, most people are not best served by going fast. Going slower and building strength in the pattern is of the utmost importance. What many miss is that we have a diagonal pattern here to the body that really connects to the core and brings out faster results to building stability and strength. If we miss this movement or don’t take time to optimize it, we miss so much of the movement. Going slower and heavier is where most people need to go and build some incredible real world strength and movement capabilities. Breaking down our DVRT Ultimate Sandbag Training system isn’t just for you guys to do more “stuff”, but to see the real thought process that goes behind our exercises and how when the software (the DVRT system) is teamed up with the right hardware (the Ultimate Sandbag) we can accomplish some pretty awesome things with people! Check out why physical therapist, Dan Swinscoe recommends the MAX Lunge to his patients!